Simply rub heels against this unique mat to safely smooth calluses and rough, dry skin. Long-lasting mat rests on the shower floor. Non-skid backing keeps it securely positioned to help prevent slipping. Great for people who cannot easily reach their feet. 1 per pack. 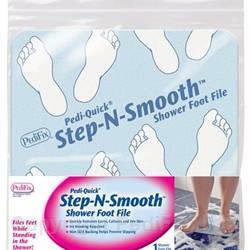 Smoother Feet — No Bending! Place file flat on shower floor with printing facing up. Turn on shower to wet file. Step on product with both feet. Using one foot at a time, move foot toward yourself to file skin, making sure your repeated strokes are in the same direction. Change feet and repeat process. You may file the heels, sides and balls of feet. To maintain proper balance, only file one foot at a time and keep other foot completely and securely on the mat to prevent mat from sliding. Rinse product thoroughly after each use. Stand product upright against shower wall to allow it to air dry. If you have diabetes or poor circulation, consult your physician before using. Do not use on foot warts.